With the next Adventure Deck en route soon, Obsidian invites the community to gather their creativity, magic and storytelling with two competitions. The winner of each completion will be rewarded with the following: The Goblin Golem Obsidian Card & 2 Die Skins! You are invited to submit a short story (see example) about your own experience playing Pathfinder Adventures. Tell us what your characters saw, endured, and how they went from unknowns to epic adventures for whom bards will sing! Now cast that creative spell and get conjuring some goodness! Do we submit our entries here, in the thread? Edited by Greenvise, 27 September 2016 - 07:18 AM. Submitting here is great. They will be collated and then we will let everyone know who the winners are when the feature closes. Here is my first submission for Contest #2, assuming that we can submit two entries per contest. The twinkle of a bell announces a customer; Vin Vinder - the local shopkeeper - looks up from his want-ads. Strolling through the aisles is that puffed-up warrior that helped out during the goblin raid at the Swallowtail Festival. Valeric is his name, or something like that. Valentine? Friendly enough, but always so smug and swaggering, this guy. Just a touch condescending, too. "Shopkeep!" intones the warrior. "Shopkeep, I wonder if you could help me out, here." Vin sets his newspaper aside with a grunt. Smiling knowingly, Valeros fingers the dull edge of a woodsman's axe, hanging from one of the racks. "My name is Vin. Vin Vinder." Valeros smirks that infuriating smirk of his. "Ah, Vinder! Yeah, that rings a bell. Sorry, old-timer. Valeros. Anyhow - Vin - I'm wondering where it is that you keep the good stuff." Vin scowls. "The... good stuff?" "The good stuff, yeah." The warrior shifts his weight, just a little bit impatiently. Vin sighs. "I don't know what you mean." "Aw, come on old-timer. There's -"
"Damn it, my name is Vin. Not 'old-timer.'" "Vin, right! Sorry. Anyway, listen. This is Sandpoint's finest general store, isn't it? At this, Vin Vinder puffs his chest up, a bit. "Indeed it is," he replies. "The best-stocked shop in Sandpoint, and the largest." "Aha," says the warrior, "then you must have some more exotic wares in stock." "Exotic...? I... I mean, we've got a few potio-"
"Sure, sure, but, I mean, mattocks and spyglasses and watered-down healing potions are fine and all, but -"
"-but you've got to have something a little more exciting in stock somewhere. I mean, look, Vin - old buddy - I'm going out of my mind in this place, you know? Sandpoint is charming and all, but there's just not much to do when it's not under attack by goblins, you know?" Valeros pauses to nudge Vin in the ribs, with a wink. "Except for that one redhead. Shayla something. You know the one!" Vin seethes. "You... you mean Shayliss? Shayliss Vinder?" "Yeah, that's it! Shayliss Vin - oh! Vinder, yeah... yeah... gosh, that's awkward." The warrior barks a hearty peal of laughter. "Now that you mention it, she did say that she was a shopkeeper's daughter. Sorry about that, old-timer. Anyway, what I'm saying is -"
And it hits him. Over the course of several long seconds, Vin's seething glare becomes a smug smirk of his own. As it happens, he does have something more exotic in stock. He thought he'd hold out for a buyer from Magnimar - alchemists and wizards could always fathom a use for such things - but maybe this Valeros fellow might like to see it. "I know what you're saying," Vin interrupts. "I've actually got something pretty strange in the back. It might be dangerous, though. It's not the kind of thing I usually sell here, but -"
"Strange and dangerous! Now you're talking, old-timer! What is it?" Vin leads Valeros by the elbow toward the back of the store. "Well, I don't exactly know what it is. I bought it from a traveling merchant when it was still a juvenile thing. Kept it in the back here - it's gotten quite large!" The sound of splashing piques Val's interest - what could be splashing around in the backroom at a general store? With a feeble flourish, Vin Vinder draws back the curtain that separates the backroom proper from a smaller alcove. Behind the drape sits a great, iron bathtub... and floundering within it is an aquatic beast the size of a pony! A disturbing combination of shark and seal, the brown-furred creature's face seems to grin, it's mouth filled with razor-sharp teeth. "Cayden's mug! What on earth is that!" "Watch yourself, now," Vin grinned. "The floor tends to get a bit slippery from all the splashing..."
With that, Vin gives the warrior the barest nudge toward the tub. Valeros' feet slip and slide beneath him - the warrior losing his balance as he tumbles into the overlarge bathtub! An uproar of splashing and yelling overtakes the backroom, as Vin looks on. "Oh dear," remarks the shopkeeper, as the bunyip and the warrior wrestle and splash. "A KNIFE! OR AN AXE! THROW ME ONE OF THOSE AXES!" bellows Valeros, as the bunyip's gnashing teeth grind and gnaw closer and closer. "Oh, those? Well those are four gold pieces each, and the knives are two apiece." "YEEAAAHHHHGGGH!" Valeros cries, as the bunyip's teeth bite into his shoulder. "Oh, gosh." Vin remarks. "Now, healing potions, those are a hair more costly. Even watered-down as they are. Afraid that'll bring your tab to fifty-six gold pieces." "AAARGH! FINE! WHATEVER THEY COST - JUST GIVE ME AN AXE, OLD MAN!" "Well, these really are a tad dull. But they're all we've got in stock. Now we do sell whetstones, you mind. Sharpen an axe right up, with one of those. Just four silver pieces each..."
And so it came to pass that Vin turned a healthy profit on his bunyip, while Valeros paid a hefty price for an evening's dalliance with the shopkeeper's daughter. Edited by Greenvise, 27 September 2016 - 08:35 AM. Here are my two card sumbmissions. A little context: I created these for homebrew character for the GF, who's a Witch-Doctor fiend in Diablo and Ranzak mega-fan in PACG. I didn't put th AD# on the cards, because I wanted her to be able to use them when she likes, but they *do* have AD numbers, indicated below. Mechanically, 'witch-doctor' can be read as exactly the same as 'witch' - a voodoo-like character, optimized to make the most mileage from her allies. Hence, the 'Devil's Breath' item, based on the eponymous real-world drug, used to 'mind-control' people. Devil's Breath is an AD3 item. Ranzak is a fan-fave in the PACG community (take a hint, Obsidian!) but up until now, a card for his trusty companion Cap'n Bloodfeathers was sorely lacking. The Captain gets the usual 'parrot' power, and is, of course, a Pirate. His checks to acquire shouldn't surprise anyone familiar with Ranzak's origin story (and if you're not, you should be - http://paizo.com/pai...ts-and-a-Goblin). Cap'n Bloodfeathers is an AD2 Ally. 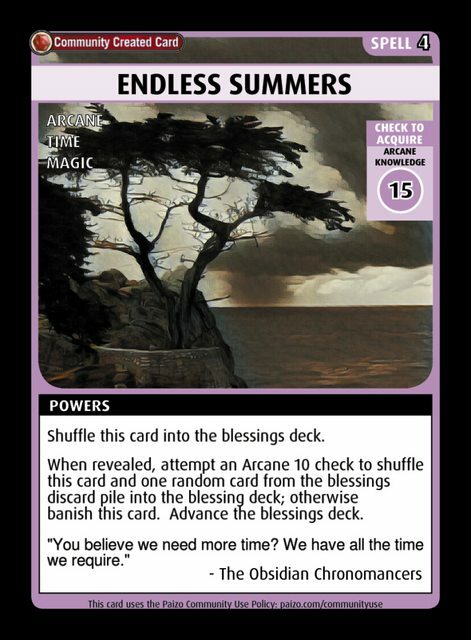 Blessing deck as a game timer? Bah! Ezren doesn't care about your petty rules! Started off as a little joke about "Coming in June", ended up going somewhere entirely different. Rise of the Runelords is lacking a Promo Goblin Character which each other box set received. My buddy Grogugg would like to help out, just leave your pets at home as he has a severe case of Zoophobia. I have roles in the works for this guy if there's interest. Edit: I completed the Role Cards for Grogugg but am having problems at DTC with it erroring out at the checkout. Edited by BernieTime, 07 October 2016 - 10:22 AM. Master Bard Cyrdak Drokkus is having a bad day. The Swallowtail Festival has begun and having stepped into the breach to deliver what, even by his standards, was a particularly excellent improvised address to the crowd; he finds his muse has deserted him. “And this is an especially inopportune time for fair Shelyn to turn her divine face against her devoted Cyrdak”, laments the bard, pacing the stage of the Sandpoint Theatre (seats still available for tomorrow night’s premiere of The Harpy’s Curse, good rates, discounts for veterans, priests and gnomes). For no sooner had he delivered his tongue-in-cheek account of the fundraising effort for the cathedral, and the laughter had died down following the story of Sheriff Hemlock, the tavern-maid outfit, and the half-orc mercenary, there had come a heckle. Kaijitsu. A glorified barmaid. Not entirely without talent, but certainly without manners. And she knows how to get under Cyrdak’s skin. And so a foolish, public wager is made – a song, tonight, in the town square, the public to judge, the stake the most important there is – pride. And so that is how Cyrdak Drokkus comes to be pacing the streets of Sandpoint, the great reveller oblivious to revels, the joker, impervious to jokes, the singer, deaf to songs. I wanna really, really, really want you to come to tomorrow’s showing of The Harpy’s Curse at the Sandpoint Theatre, seats still available in the stalls. But his head is full of songs nobody would want to hear. A great artist can find inspiration in the everyday, and there is a festival taking place in the town. Little happens in Sandpoint – even the new troupe of adventurers seems quite dull and have hardly slain any dragons at all. Certainly, they have done nothing worth a song. But maybe fickle Shelyn will bless hapless Cyrdak if he walks amongst his people. The town square – scene of Cyrdak’s imminent humiliation – is its usual bustling self, but there is little to inspire the artiste. Here a street vendor hurriedly packing a stall, there a juggler obviously trying to amuse the local children by hiding under a bench, and there one of the adventurers. “Ah, yes, Kyra, is it?” calls Cyrdak – he has always been so good with names – as she – for some odd reason – lays about some kind of goblin with a mace. She may be a priest of some kind, but her manners leave a little to be desired as she doesn’t even hail the bard, and keeps her attention on the goblin, even though the little fellow is far less handsome than noble Cyrdak. Stung, the bard moves on. “No courtesy in that one, Cyrdak”, he remarks to himself “No discount for the much-anticipated opening night of “The Harpy’s Curse, for her”. Idly, the bard notes that the cleric’s mace appears to be on fire. Frankly, the Swallowtail Festival itself is a disappointment. Clearly, the people of Sandpoint have divined that the best bard in the city is downcast, and have taken their lead from him. Indeed, the whole affair seems to be very laxly organised, with folk running hither and thither and very little organised merriment at all. He must have a word with the Mayor tomorrow when she attends the opening of The Harpy’s Curse and take a firmer hand on the tiller for future events. A cheery little fellow up ahead by a cart of fireworks seems to have the right idea, though, bearing a burning brand, doubtless to set a few off to perk up the spirits. Cyrdak is a little confused as to why so many goblins appear to have joined the festival, but he hurries up. “I say you look like a fellow who would enjoy a splendid recital of the Harpy’s Curse”, he begins, but then the diminutive pyrotechnician slumps to the ground, an oddly-sparking arrow in his neck. The elven adventurer Merisiel – not very musical, not terribly interested in his play when he offered her one of the seats with a better view – hurries over. “Thanks for distracting him, bard, gave me a clear shot.” she mutters and he makes to protest but she has already disappeared. These people! So rude! Cyrdak mentally takes her off the guest list. Never gonna run around and desert you - no, no, nobody will remember it. Still bereft of ideas, Cyrdak goes for a walk towards the gate. Perhaps a turn outside the city might clear his head? But no, that way is out, for is that not his rival, Kaijitsu, with that burly chap Valeros? Now, he is a gentleman with…potential. Interested in the play (well, in the bar at the theatre, but as Cyrdak always says, once they’re in the house, they practically in the stalls already). But sadly, it appears, poor taste judging by the company he keeps. And is that – ugh – Ameiko’s brother loitering by the gate? “Now Tsuto, there is a base ruffian”, considers Cyrdak. And the language the Kaijitsu woman is emitting! No poetry there! “Doubtless a family reunion”, Cyrdak muses as Valeros rushes by, seemingly in a hurry to show Tsuto his drawn blade. “Probably the kind of thing their type finds interesting” he thinks in disgust, before moving away, pausing only to congratulate himself on remembering - from his study of weaponry for the forthcoming production of “The Harpy’s Curse” - that the pole-arm that the fighter was wielding is called a "glaive". And also that it appeared to be on fire. “One cannot reach the pinnacle of art without a keen sense of observation”, he declaims to nobody in particular. But his spirits are fading. If only something out of the ordinary were to happen! But then Cyrdak’s shoulders lift once more. If Kaijitsu is off revelling with her brother – and judging by the shrieks they are up to whatever barbaric amusements they find diverting – then she is not at The Rusty Dragon – and it occasionally serves a drop of something warming that is not wholly disagreeable. Many of the greatest artistes have found inspiration in their cups? Might Cyrdak follow suit? It's time to meet Cyrdak on the Cyrdak Show to- no, no, NO! Cruel Shelyn still evades her humble supplicant as Cyrdak arrives at the doors of the Rusty Dragon, and his mood is not improved by the sight that greets him as he enters. Not only are there few patrons to remark on how magnanimous Cyrdak is to grace the establishment of his rival with his presence, but at the bar is the charlatan Gandethus, the so-called wizard, with another of those adventurers - the mage Ezren. No matter. “A gentleman is magnanimous”, thinks Cyrdak to himself, thrusting from his thoughts the incident but 4 months previously when Gandethus had described a particularly fine stanza about a manticore as “Perhaps not completely crypto-zoologically correct”. How wounding to an aesthete of Cyrdak’s quality! And how typical of a boor like Gandethus that he prioritises earthbound detail over the soaring heights of artistic interpretation. “Besides,” considers Cyrdak, “Gandethus constantly uses over-elaborate verbiage to feign erudition. It is the very acme of mummery”. “What ho, gentlemen scholars of the arcane!” cries noble Cyrdak, but, sure enough, the two ignoramuses – ignorami? – are deep in conversation. “I can do it, but there’s a risk, Ezren”, says Gandethus. “How much?” replies the other. “Well, no more than one part in, say, twelve” ventures Gandethus, and the two agree to hazard it. This is clearly conversation they intend to exclude Cyrdak from, and he frowns to indicate his disapproval – Gandethus, is, of course, pretending to some kind of dweomery at this point – and turns to leave this disappointing establishment. He had been too preoccupied when he entered to notice that the left portal was not properly secured in its hinge, but his keen observer’s mind takes note and he vows to send Kaijitsu a recommendation for a decent carpenter in the morning. Behind him the two wizards are in hurried conversation. “Ezren, it’s loose!”, cries Gandethus, and Cyrdak departs in irritation. Of course it is – he could have told them that! All that over a poorly-fitting tavern door! And that roaring sound! How on earth does Kaijitsu actually get custom? Cyrdak shakes his head. There is nothing else for it. Cyrdak must petition callous Shelyn directly. Father Zantus is a civilised man – front row seats for the forthcoming performance of The Harpy’s Curse – and many great versifiers have found the moment striking them in the surrounds of the devotional. There is a great crowd gathered at the Cathedral, which is most inconvenient for a fellow who wishes to use it for its intended purpose. For no clear reason, a fellow dressed as some sort of goblin, is riding what is clearly a bad model of a variety of lizard – a gecko, Cyrdak remarks to himself, pleased by the recollection. You can clearly see the join in the lizard costume, although Cyrdak will allow that the way it climbs up the walls of the cathedral is quite well done. “Some part of the festivities, no doubt, but in rather poor taste”, considers Cyrdak, promising himself that next year’s will be far better when he has complete artistic control. Over to the right he spies the priest Kyra once more, doubtless having turned her attentions from the fellow she was obsessed with previously. “No understanding of dramatic convention, that one”, he thinks, sadly. Even the most amateur director knows that it is tradition to enter stage left. As she runs over towards the showman and his ersatz lizard – that mace, again, how gaudy those flames are! – Cyrdak looks about himself for something – anything – that might uncage his muse, and that’s when he hears it. His saviour, running in, stage LEFT, his warcry - sheer poetry! His costume – exquisite! Kindly Shelyn smiles upon her devoted Cyrdak once more. Kyra rather ungraciously smites the poor puppeteer and his outsized mannequin with her burning mace. Again, quite convincing blood but obviously fake when you’ve the art. Cyrdak’s saviour also summons flames – of course, how fitting, what a natural dramatist! – and with that, the spectators disperse and the festival continues. Cyrdak hurries over. Kyra is in conversation with Father Zantus, but the other, the hero of the hour, quickly flashes her a grin and then stands, obviously recognising a fellow artist. “What a performance! What a show! What a HERO!”, enthuses Cyrdak. “I…I is hero?” replies his companion, “yes, yes, I is hero!”, he agrees. Master Bard Cyrdak Drokkus is having a good day. A little tweak to the scansion of the last line….oh yes, Kaijitsu is going to regret her challenge! Now, where to find a toad to wear as a hat? Edited by Chris_R, 30 September 2016 - 11:06 AM. And here's my second attempt at Contest 2. Yes, I am a fan of the works of Damon Runyon, why do you ask? I am waiting the bar, thinking the sort of thoughts that get a girl a reputation for being a bit downcast, when it starts to rain outside. Rain is good, because rain means wet citizens, and wet citizens just naturally turn their thoughts to getting inside somewhere warm and dry and then perhaps putting inside themselves something cold and wet. What with one thing and another and my old man being a jackass and my brother being a bigger jackass and a dodge whereby a guy with a toad on his head just outsings me, a girl could use a little company and a little more entertainment. It must be my lucky day after all because the little bell at the tavern door goes and in walks a guy by the name of Valeros. Val is a good guy and a better drinker and he goes about town with a bunch of characters who get up to scrapes and adventures and are generally in the heroing business. Val and his pals are commonly to be seen around town looking pretty swell with all the citizens they save or treasure they haul out from some den or other. And heroes who haul treasure out of dens are apt to be free with the gold and freer with the tales and whilst I like gold I am pretty sure I like a good tale more and especially right now. But Valeros is not looking swell at all. He is looking gloomier than my brother does when I give him a little steel goodbye the other day, and that is particularly gloomy. And I cannot help but notice he is wearing nothing but his smallclothes, not that a girl would be looking at Valeros’ smallclothes when his chest is demanding so much attention, and the rain has wet him more than somewhat. I give Valeros the big hello. “Val, I hope and trust that there is a reason for you to be going about town in just your smallclothes? I at least expect to see you with a sword or an axe or perhaps a glaive or two, just for the look of it”. If word gets around that Val enters my fine establishment in just his smallclothes, citizens will just naturally start to conclude that this is an establishment for guys in their smallclothes and this may invite comment. Val is a good guy and commonly hauls enough treasure out of dens to account as a fair adventurer, but he has this problem with harpies and one and all knows it. So Val has an ale and then perhaps a short spirit and maybe another ale and he commences his tale. It seems that Val and his crew are looking about for some monsters to discuss the art of combat with or perhaps a caravan to guard but it seems many of the local monsters do not care to discuss the art of combat with Val and his crew as some of them have this kind of discussion already and do not enjoy it and word gets around and pretty soon their discussions of the art of combat are in no sort of demand at all. But then Val meets a guy who tells of a group of loggers who come home late one day minus their logs and indeed all of their tools and clothes and asks him to look into it. Now Val hears this tale of loggers coming home without their clothes and his thoughts just naturally turn to that time at the Old Light where he meets a harpy and on hearing her song he concludes that the only thing to do is to drop his axe or maybe his glaive and then his armour and then to remove himself from the scene. Because it seems that harpies are not interested in discussions of the art of combat but wish merely to sing and no matter how good your discussions of the art of combat might be, they simply will not hear them, what with all of the singing. And then he thinks of that time in the tunnels beneath Sandpoint, or that time with the harpy figurine in Old Vinder’s shop and how those times also finish with him removing his axe or his glaive and then his armour and proceeding homewards at speed, and especially that last one as it seems when Old Vinder sees Val in just his smallclothes in his shop, so does his daughter and a hurtful conversation takes place with some accusations that Val finds personally very wounding as he is sure he and Shayliss are more discreet. But Val is a little more experienced than those times and he practises his footwork and his discipline and moreover he purchases some earplugs just in case and so he concludes that this assignment is like gold in the bank and he gives his assurance to the logger guy and they drink a drink to seal the deal and then another because the first one is pretty good for a drink not from the Rusty Dragon. Now Val heads out of town up the river and the day is looking pretty good especially when he comes upon some gentlemen from out of town who appear to wish to discuss the art of combat with him and he outs with an excellent argument that one and all find particularly compelling and he proceeds on his way perhaps a few gold heavier and with a nice helm one of the out of town gentlemen leaves behind when the discussion concludes. Pretty soon he happens upon bunch of logs and axes and checked shirts and he concludes that this is where the loggers take off as being a keeneyed adventurer he notes that axes and logs and checked shirts are the kind of attire associated with loggers and especially with loggers who turn up in town in their smallclothes. Val gets his armour and he gets his glaive and he puts the new helm on as he is sure it is made by some guy who knows a thing or two and as anyone knows a helm made by a guy who knows a thing or two is better than some bits of wax when it comes to a discussion of the art of combat with anything that has wings and one thing I can tell you about a harpy is that wings come as standard. It is at this point that Val recalls that the time he meets a harpy at the Old Light, it is his friend Kyra who has a strict discussion with it and then that time in the tunnels it is Kyra again who has a few stern words with the harpy and that it is Kyra who Old Vinder calls in to clear his shop and then perhaps have a talk with his daughter about a life of sanctity and discipline. Indeed, he recalls that when it comes to stern words with harpies and skeletons and zombies and the like, it is most commonly Kyra citizens wish to hear from and also when some citizen needs to hear a few words about a life of sanctity and discipline although Val also recalls some times when Kyra is not always as free with the old sanctity and discipline as some citizens and especially Old Vinder might expect. Now, Kyra is not with him on this caper and this makes Val anxious and when Val is anxious he is apt to wish for an ale and if there is no ale then you do not always see the best of him. But then he recalls that he is no slouch at discussing the art of combat with skeletons and zombies and the like and that he practises his discipline and he has a helm that he is pretty sure is made by a guy who knows a thing or two and this should be more than enough to deal with a harpy. And then he remembers the wax and he thinks that a guy cannot be too careful and he takes off the helm, and he shuts up his ears and then he replaces the helm and pretty soon he cannot hear one slightest thing and especially no harpies. It seems that when Valeros puts in the wax and puts on his helm and cannot hear one slightest thing, he forgets that a harpy is not a forest creature but a satyr is, and that is why when the satyr comes he does not hear it and so he has no time to show the satyr his footwork and so before he knows it he drops his axe and his glaive and even his helm and just naturally proceeds directly back to town in just his smallclothes. Because like harpies, satyrs have no time for discussions of the art of combat and such discussions have no effect on them whatsoever and only footwork will do. Well, I give Valeros another ale for his plight and we agree that he cannot just go around town in just his smallclothes and especially not to tell Merisiel the tale. So I find Val some clothes that my jackass brother leaves behind and although they are perhaps one size too small or maybe two, then at least it keeps his chest out of the rain although personally I am not at all sure that Val’s chest really needs to be out of sight. And of course I do not let on that when the logger guy finds Val to ask him to find the logs and the axes and the check shirts, he recently comes from my fine establishment asking for aid in this matter and I just naturally think of Val and how all the treasure hereabouts has been hauled out of dens. And I am not sure that I wish Val to know I set him up with this caper, because then Val and his chest and his gold and especially his tales might be seen a little less often in the Rusty Dragon and nobody around town wants that as one and all knows that the Rusty Dragon is the best place in town to get a cold ale and perhaps see an adventurer in just his smallclothes. Edited by Chris_R, 01 October 2016 - 12:26 PM. Okay, so I'm gonna post two cards that I made a little while back but am SUPER proud of. Hopefully you guys like them and they end up in the digital version of the game!!! 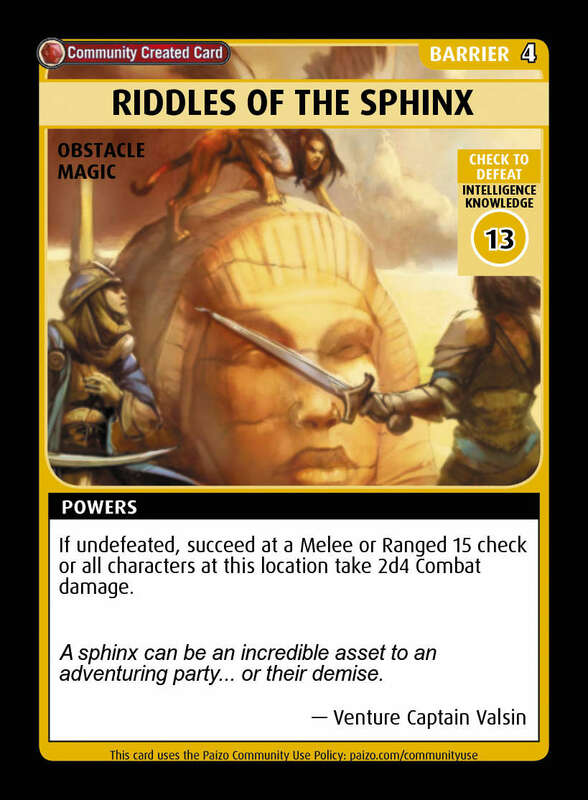 EDIT: The art for both cards are found on the Paizo Blog, so they're community use. Edited by cartmanbeck, 06 October 2016 - 10:35 AM. Two simple food-based cards (food always played a part on my Role-Playing sessions, and I find it somewhat lacking on Pathfinder ACG). Hope you enjoy them! PS: I am a lousy at drawing, so I picked some web images. Please, do not use them, ok? Edited by MauGibrin, 09 October 2016 - 12:49 AM. Had a silly idea for another card and decided to post it here. But it's not meant to be part of the contest, ok? Thank you all for the awesome contributions! 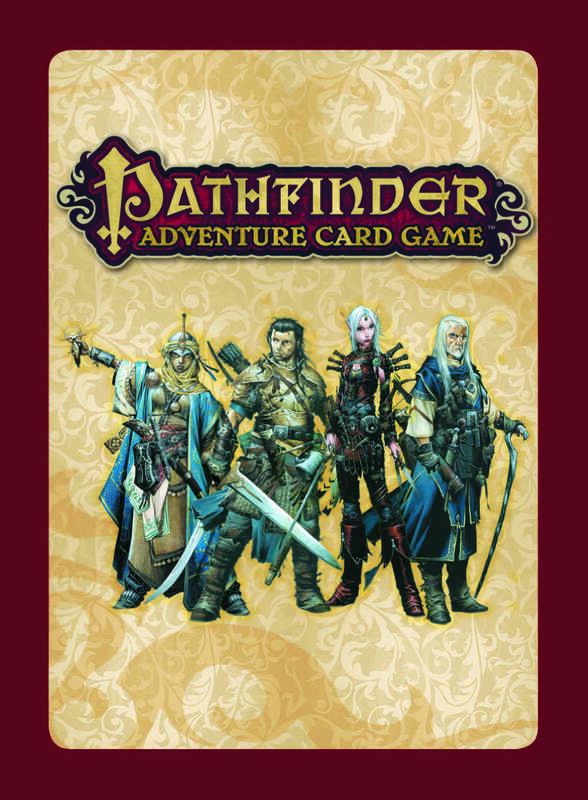 We'll be announcing the winners during this Thursday's (10/13) Pathfinder Adventures stream!